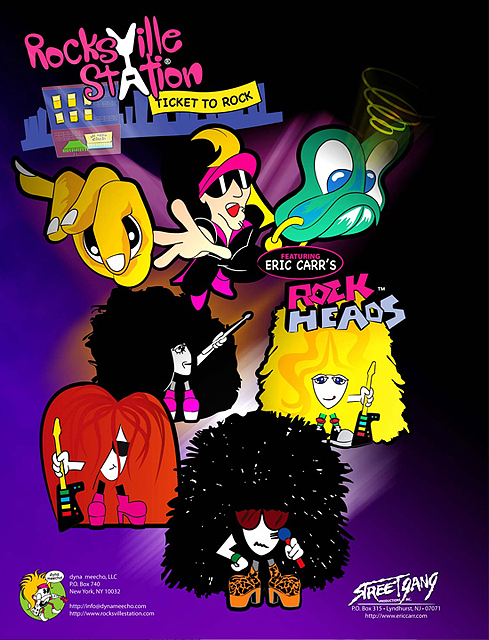 NEW YORK CITY, NEW YORK; Rocksville Station® comics is proud to present Eric Carr’s Rockheads™, a multimedia cartoon series created by Eric Carr. Publisher Dyna Meecho, LLC is currently working with Streetgang Productions, Inc. to bring you this cameo appearance of The Rockheads™ in comic book form. The street date for the publication will be April, 2011. The Rockheads™ were created in the mid 1980’s by Eric Carr, the late drummer of the legendary rock band Kiss. Throughout his years with Kiss, Eric’s characters took shape and matured into an adorable cartoon series, with each one having their own special features and unique personalities. Eric had a vision for The Rockheads™ and attempted to pursue that vision with the aid of Gene Simmons and Paul Stanley. In 1987, Hanna Barbera Corporation and Landmark Entertainment showed a sincere interest in marketing The Rockheads™, recognizing that the fun, rock n’ roll theme would be appealing to many different age groups. However, because of Eric’s untimely death in 1991, he was unable to bring his project to fruition. The Carr Family strongly believes in Eric’s vision of The Rockheads™, and have decided to pick up where Eric left off. Kiss fans number in the millions and have waited years to see The Rockheads™ surface. Today Eric’s vision is premiered in Dyna Meecho’s second issue of Rocksville Station® titled “Ticket to Rock”. The Rockheads™ are owned by the Carr Family, Bruce Kulick, guitarist for Kiss (1984 to 1996) and Adam Mitchell, a well respected song writer who’s songs have been performed by Kiss, Chicago, John Waite, Patty Smyth and Scandal, Paul Anka, Waylon Jennings, Merle Haggard, Bonnie Tyler, Art Garfunkel, Anne Murray, Nicolette Larson and dozens more. Kiss Army Sweden önskar lycka till med projektet, vi hoppas snart får se Rockheads.